War is an easy card game involving 2 or more players. 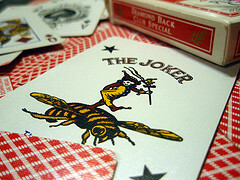 It is generally played with a standard deck of 52 cards with Jokers, but any number of decks or types of decks can be used. The object of war is to win all of the cards. Deal all of the cards evenly to those that are playing the game. Make sure they are faced down and that no one looks at any cards. Each player should now have a stack of cards in front of them that are faced down. At the same time, all players take the top card off their stack and lay it face up in the middle of the table. The player that laid down the highest card wins that hand and takes all those cards that were laid down. Winnings should be made into a new stack, faced up, by each player. Continue playing hands (repeat steps 2 and 3). Once a player runs out of cards in their faced-down stack, they simply turn their winnings stack over and continue play from there. If there is a tie for the highest card in a hand, a war occurs. For a war, the tied players draw 3 cards from their own stack and then place the 4th card face up. The player who has the highest 4th card wins all of the cards that were played in that hand (this includes the original cards played in the hand, and all the cards involved in the war). Over time, players will completely run out of cards. Once this happens, they are out of the game. The winner will be that last player left and should have earned all the cards in the deck. Lowest is 2, then 3, 4, 5, 6, 7, 8, 9, 10, Jack, Queen, King, Ace, and Joker is the highest.